All hail the MeatGod. At 9:58 am on the first working day of the new year, he emails the rest of Steak Club 7; “happy new year fellow carnivores! let’s get this year off to a great start- when’s first steak club?” Nothing kicks of the year like a gathering of the fellas to take down a juicy hunk of beef. 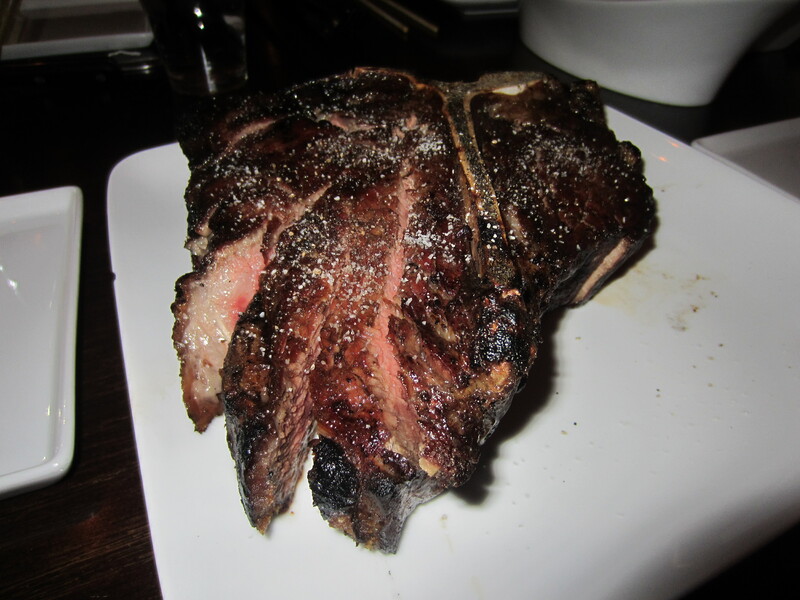 After only a few emails, we had a steak on the books, just in time for joeC’s birthday! 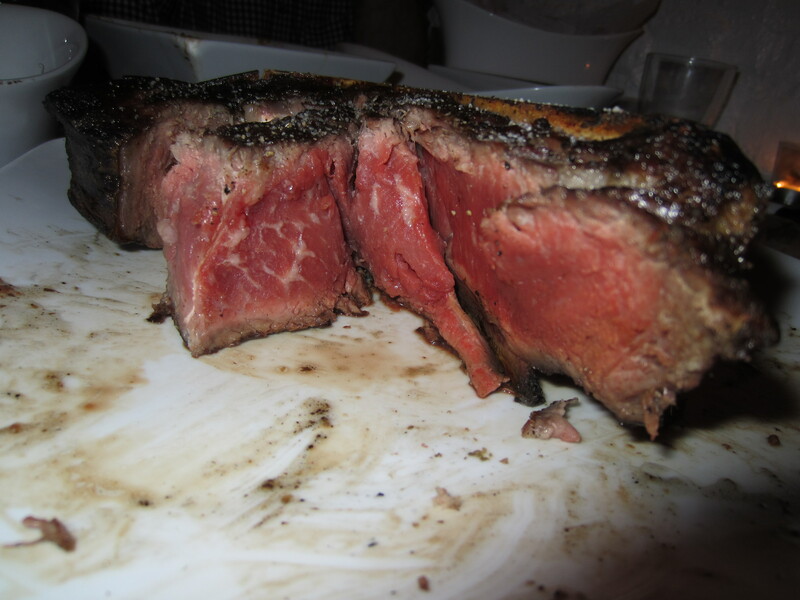 Prime & Beyond first opened in Fort Lee, NJ in 2003 built a reputation serving USDA Prime Steaks. Built on the passion and knowledge of owner “Q the Butcher” and his brother Kevin, in 2011 the company expanded into a 2nd location in New York City. It’s a new age steakhouse with a modern decor and an exposed kitchen. 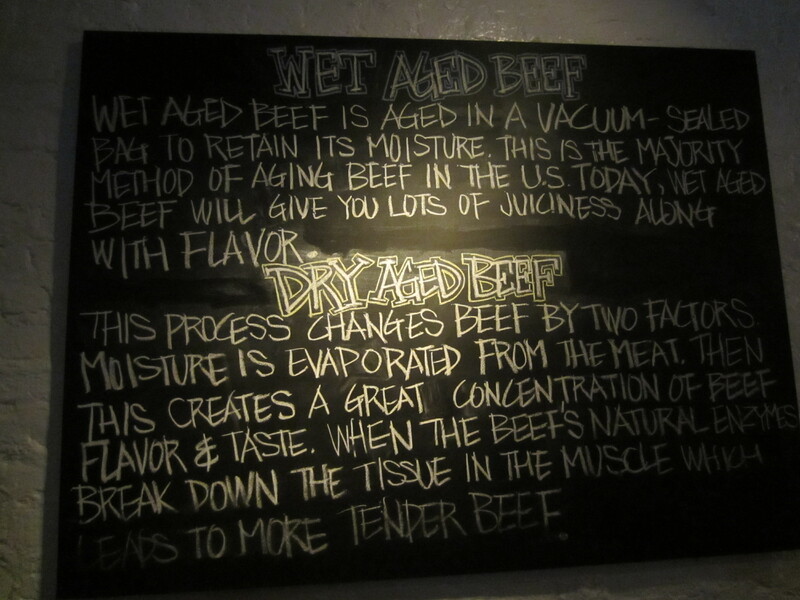 The menu is primarily beef, both wet & dry aged with a few other accoutrements including a dash of Korean fair with kimchi, rice and bulgogi. Their supply of steaks come from Master Purveyors from the Hunts Point Meat Market. With bacon, sausages, salami, hot dogs and steak, lots of steak, we were all pretty excited to eat at Prime & Beyond. 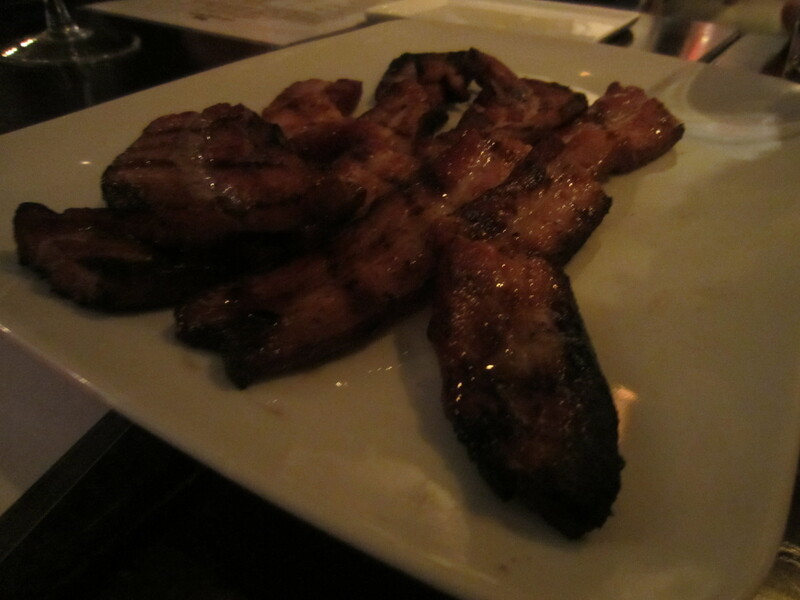 Our meal, started like it often does, with bacon, specifically the “PB Special Bacon.” This was my favorite part of the meal. It was smoky, had just the right amount of fat and cooked perfectly. 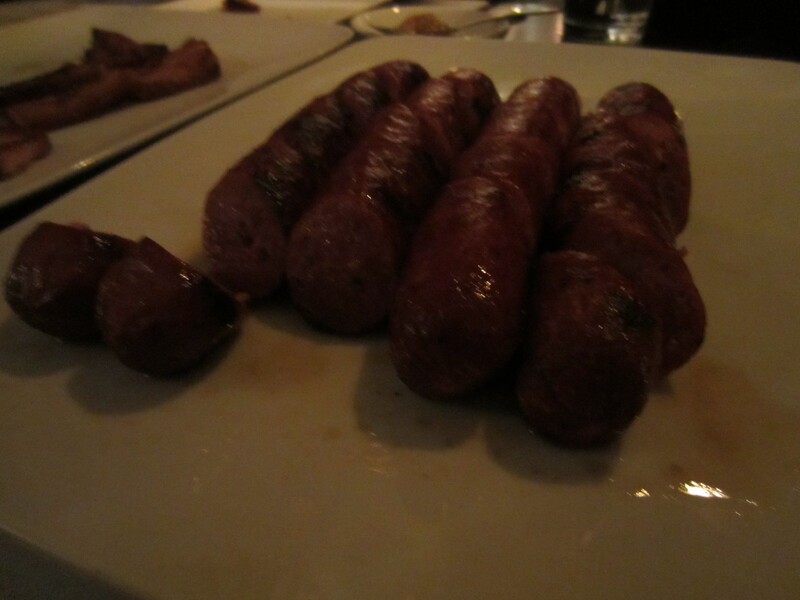 Along with the bacon we also had the Wagyu sausage links which tasted like a smoky kielbasa. 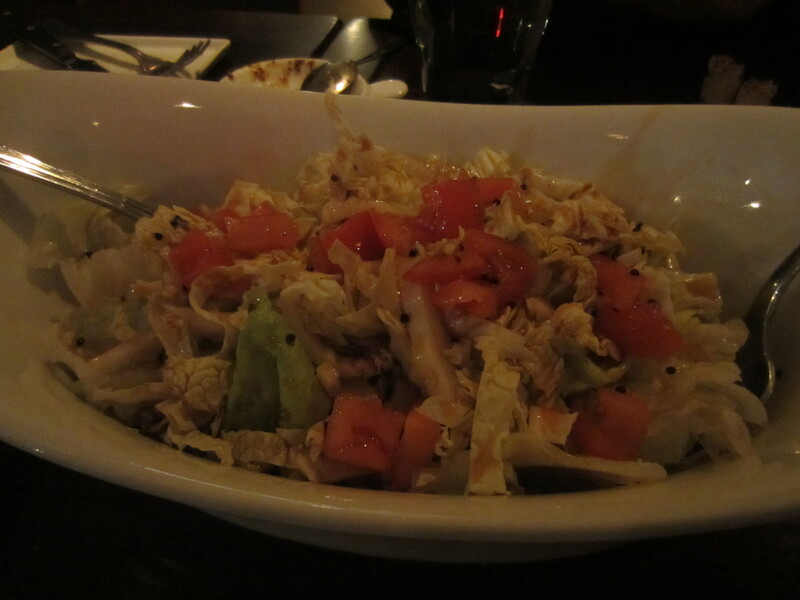 Prime & Beyond serves a special salad that has a tangy Asian dressing over lettuce, cabbage & tomatoes. 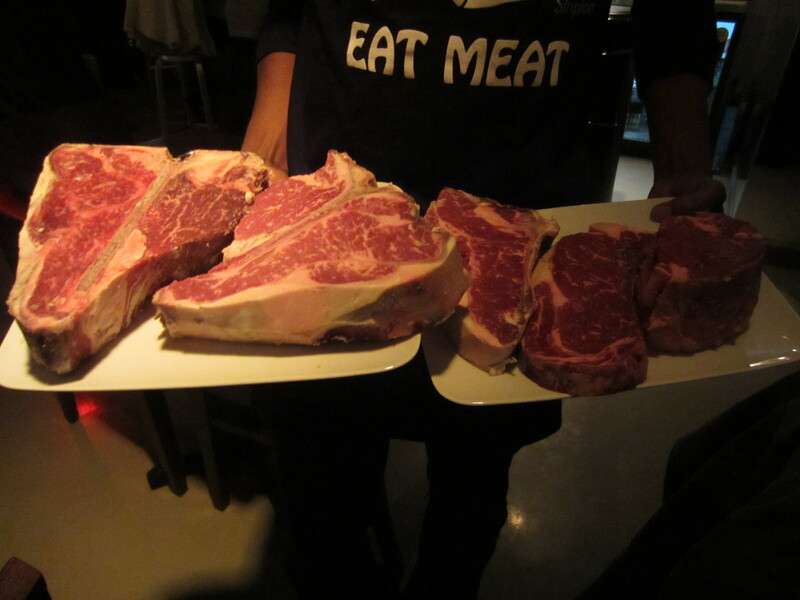 Before preparing our steaks, the server, in a very cool act of class, brought the raw cuts over to the table for us to peruse. If that doesn’t get you excited to eat, I don’t know what will. 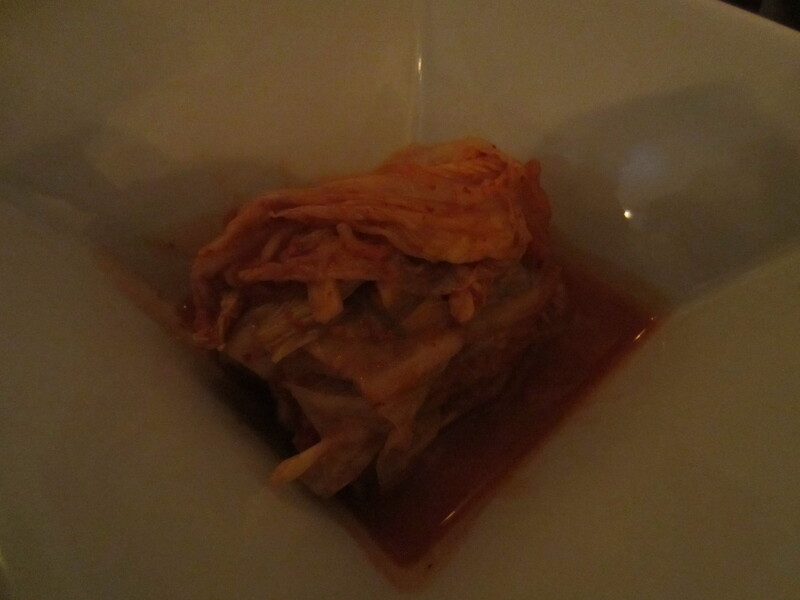 I don’t eat kimchi but the other guys seemed to enjoy it. 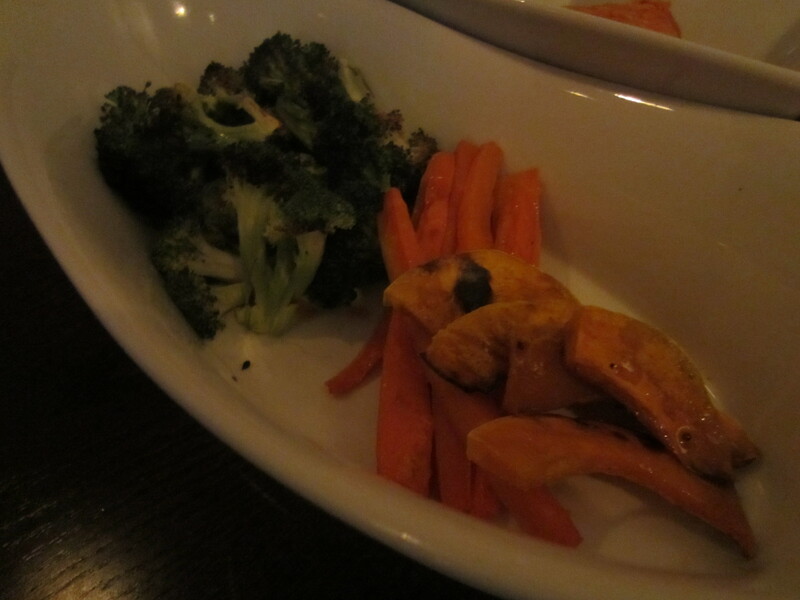 I really enjoyed the grilled vegetables especially the sweet potatoes. 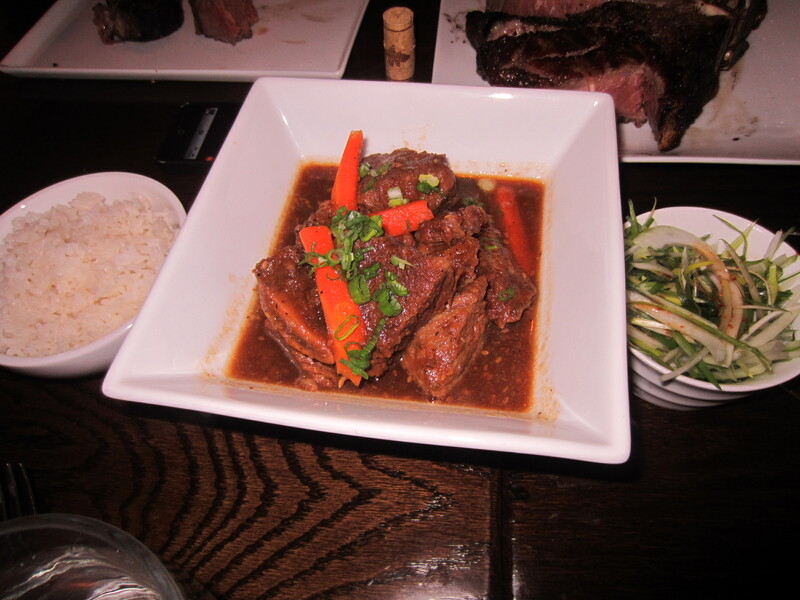 It’s listed as a main course, but we absolutely had to have the short rib stew bowl to share around the table. I really liked the broth and the tenderness of the meat but wish they had removed the meat from the bones before serving it. 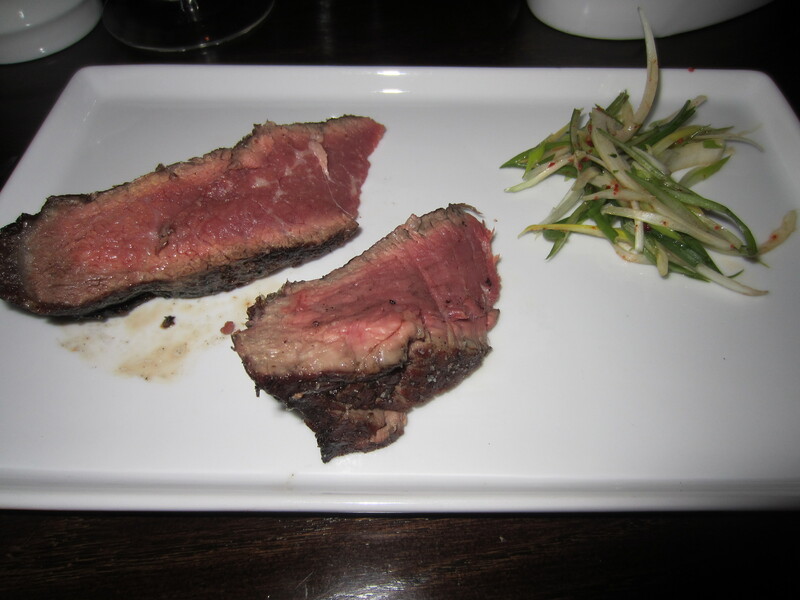 Matt ordered the wet aged filet and was a little surprised when it arrived pre-sliced. 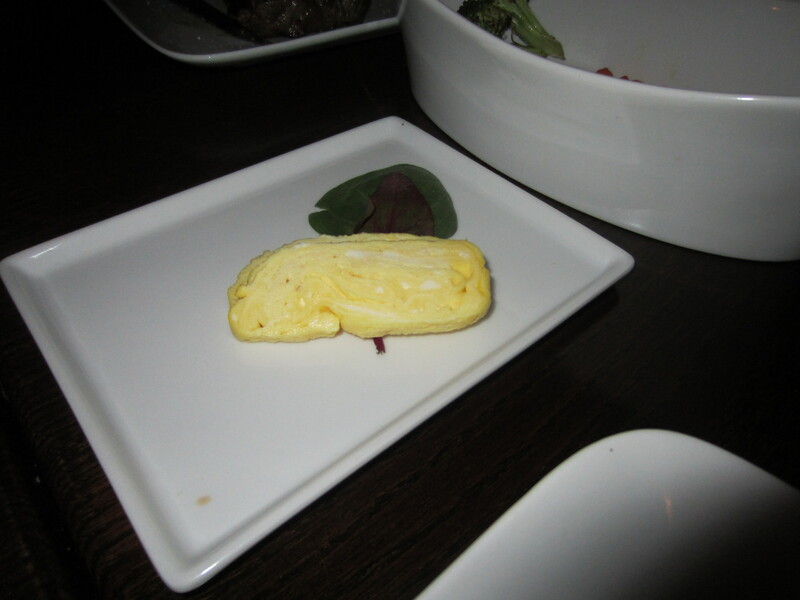 A cold sweet egg omelet, like tamago came with our meal. I thought that was an interesting addition to a steak dinner. The Big P.A. and I split a dry aged porter house for 2. We too were surprised when our steak arrived sliced in this bizarre fashion. 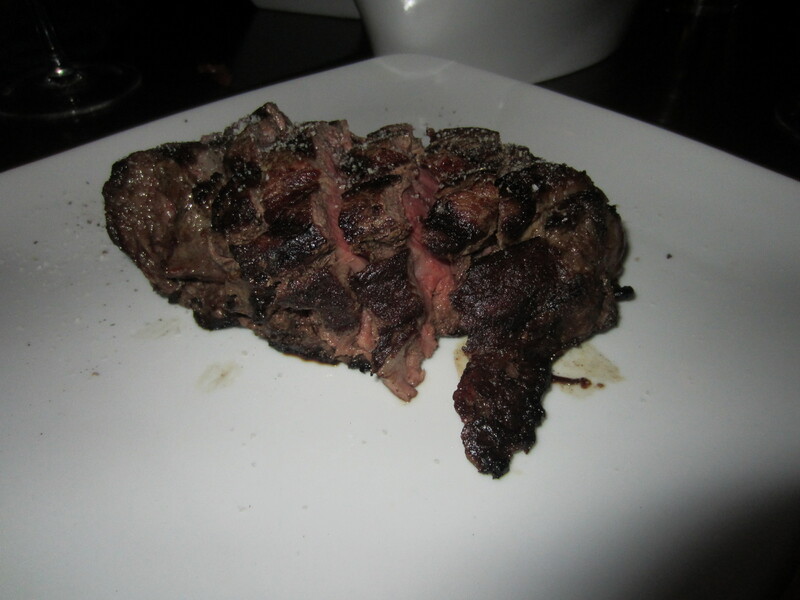 However, I was elated to see the steak was cooked to an absolute perfect medium rare. 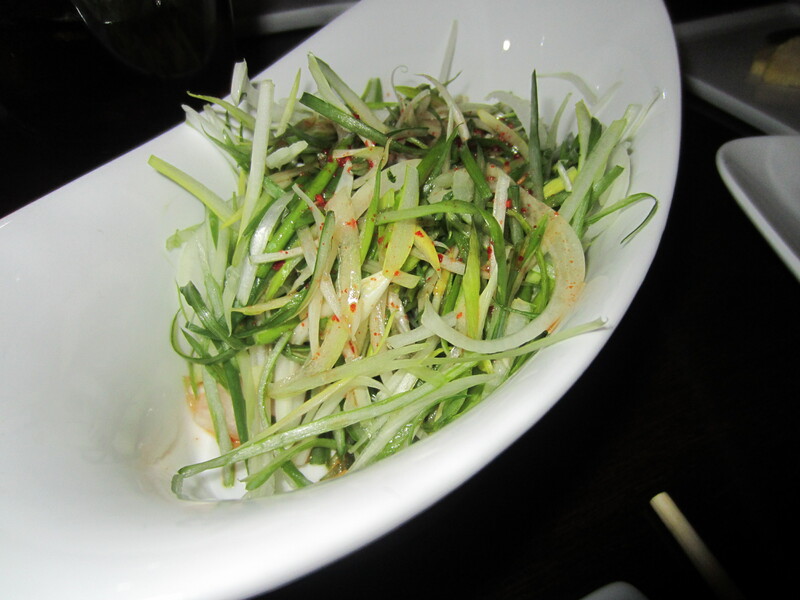 The steaks at Prime & Beyond are served with a scallion salad, which the waiter explained to us is meant to be eaten a top the steak. 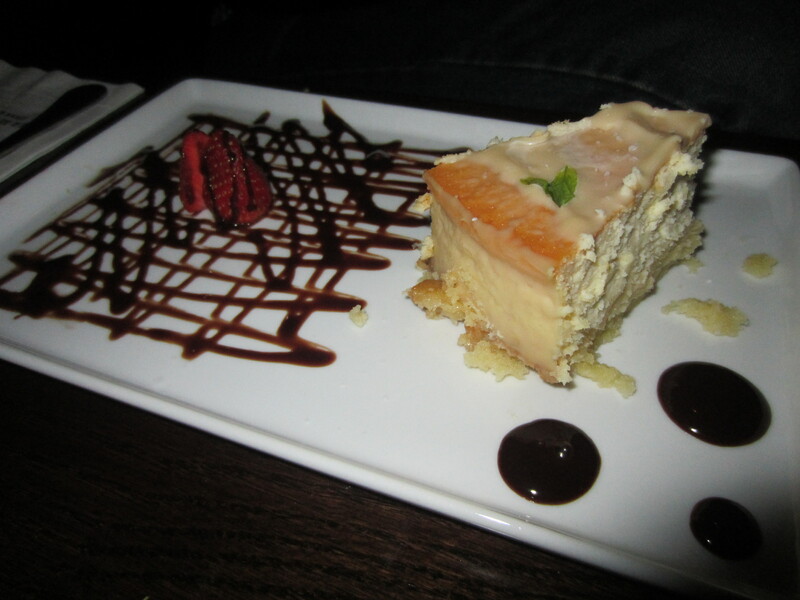 I tried a couple of bites and not only was it unique, I liked the mix of flavors it created. If the odd slicing of the meat wasn’t enough to warn me, the below room temperature of the meat certainly let me know something was wrong. Upon further examination of the meat, I found it to be extremely fatty and beyond what I would ever consider proper marbling. 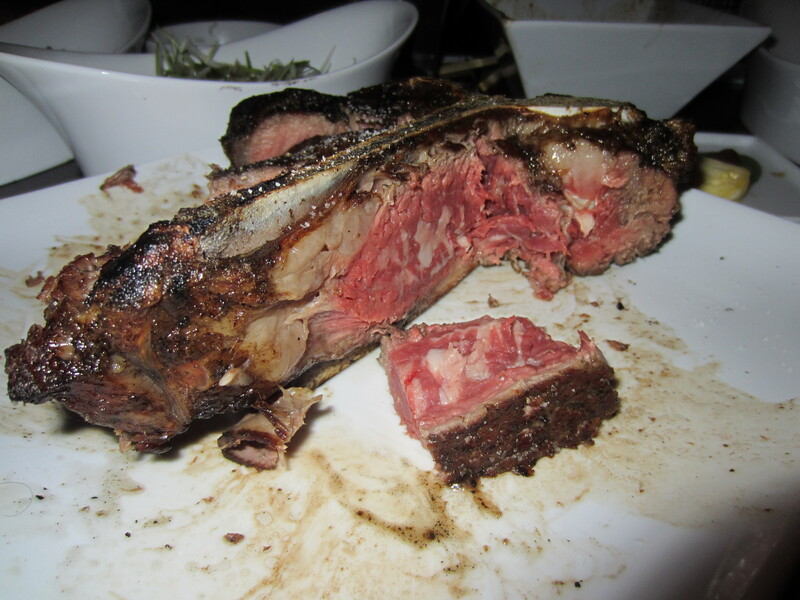 For a relatively small cut of a porterhouse, this may have been the first time the Big P.A. and I did NOT finish off a steak at one of our gatherings. It wasn’t just our steak either, it was everyone on the table. 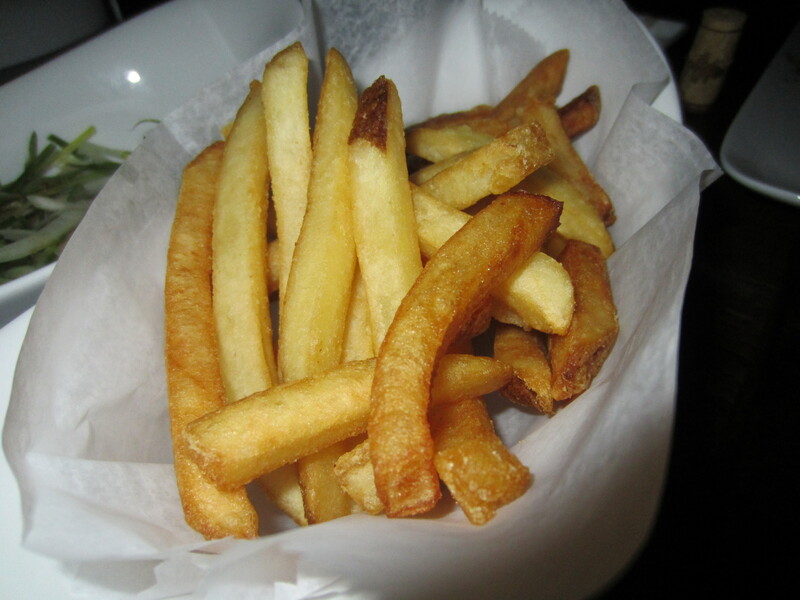 We also order King Oyster Mushrooms and French Fries. 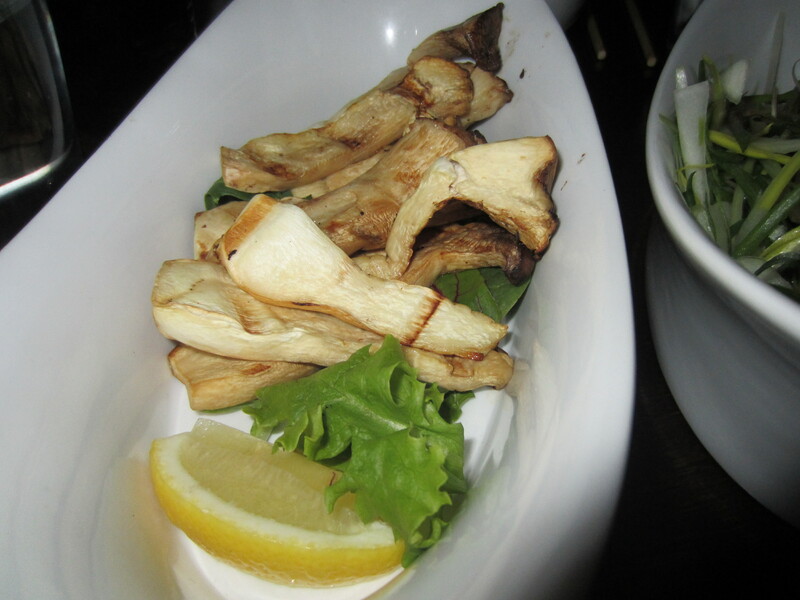 I didn’t try the Mushrooms because I don’t eat the fungus but the french fries were decent. At the insistence of the Big P.A. we ordered a couple of desserts for the table. 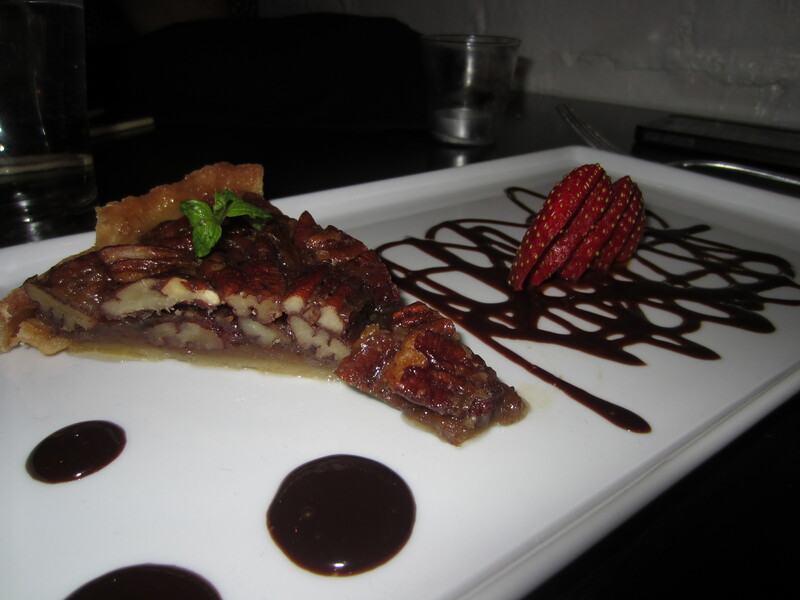 They had a great presentation and the pecan pie was pretty good. Up until the steak, I was really enjoying my meal. The oddly served, cold and fatty cut pretty much guarantees we won’t be returning.